In December 2009, the Container Recycling Institute issued Understanding Economic and Environmental Impacts of Single-Stream Collection Systems, a comprehensive white paper documenting the controversy with single-stream recycling. The impressive paper is well researched and worth the read for those concerned about the ultimate destination of good-hearted recycling efforts. It is important to understand that diversion from disposal is not recycling. Collection is not recycling. A product is not recycled until it is made into another product. Broken glass used as landfill cover is ―downcycled‖ into one use only. Closed-loop recycling occurs when a product can be made and remade infinitely, such as recycling containers back into aluminum cans and glass and PET bottles. Historically, one of the greatest challenges in single-stream collection has been glass. It is virtually impossible to prevent glass from breaking as it goes to the curb, is dumped in the truck, gets compacted, gets dumped on the tipping floor of the MRF, is repeatedly driven over by forklifts, and is dumped on conveyor belts to be processed by the MRF. Therefore, it is highly unlikely that glass collected in single-stream systems will be used for its highest closed-loop application—glass bottles or fiberglass. Unless there is beneficiation capacity nearby, which can clean the glass to recyclers’ specifications, single-stream glass will be downcycled to a use that is far less desirable in terms of energy conservation, avoided emissions and other high-end benefits. The most likely end uses for mixed cullet from a MRF is sandblasting base, aggregate material, or Alternative Daily Cover (ADC) for landfills. The ZWZ team is working on creating an economic model for separated glass recycling. Strong demand for the recycled glass and collection infrastructure are the two main challenges. Once a viable system is developed ZWZ participants who serve alcoholic beverages will be required to separate glass for recycling collection. Stay tuned for developments. Effective the first of 2010 the Zero Waste Zone program is an Elemental Impact project. The ZWZ Leadership remains the same with Laura Turner Seydel continuing as the ZWZ Chairperson and Holly Elmore as ZWZ Director under her new position of Elemental Impact Founder & CEO. The foodservice industry will continue to be the engine driving the ZWZ program with focus retained when the impact expands to other industry segments. Stay tuned for exciting ZWZ updates. Welcome Hadley Baur Laughlin to the ZWZ Team as the ZWZ Project Director! Hadley volunteered with the ZWZ program since the initial 2008 planning meetings and now formally joins the team. With her strong organizational skills, Hadley will initially focus on developing the Elemental Impact website followed by stream lining the ZWZ documentation process. Hadley will meet with each of the launched Zone Champions to create a zone plan for building depth and increased participation. Holly Elmore of the Green Foodservice Alliance for her leadership and vision in establishing the GFA's "Zero Waste Zone" and challenging and supporting us to become the first hotel to meet this criteria. The ZWZ Team is honored to work with committed professionals like Randy and his associates who understand ACTION is an integral component to sustainability. Dave Rossman, Doubletree Buckhead General Manager, continues to be one of my favorite heroes! 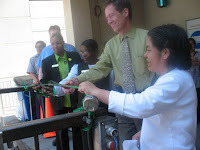 On Earth Day 2010, the Doubletree celebrated the conversion of their 30 yard compactor to a recycling compactor with a ribbon cutting ceremony. When their two yard dumpster recycling system no longer made sense, Dave worked with Republic Services to flip flop their 30 yard trash compactor for recycling and their two-yard recycling dumpsters for landfill collection. Earlier this year, the Doubletree started separating out their glass and B Good Recycling is collecting it for recycling. In the past two plus years the Doubletree has reduced their per occupied room landfill collection 45%!!! The 2007 6.0 pound rate was 3.3 pounds by the end of 2009. For 2010, the goal is to reduce the rate to below 2.0 pounds and they are well on their way! Remember, Dave Rossman contacted the ZWZ Team in February, 2009 as a referral from the Sustainability Division of the DNR. By May, 2009 the ZWZ~Buckhead launched with 60 foodservice operators in attendance. Dave Rossman is an icon of Integrity in ACTION ~ thank you Dave for your commitment!